Rockefeller Center was named after John D. Rockefeller, Jr., who leased the space from Columbia University in 1928 and developed it beginning in 1930. 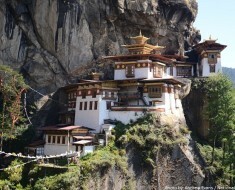 Depression’s worst years, the project gainfully employed over 40,000 people. 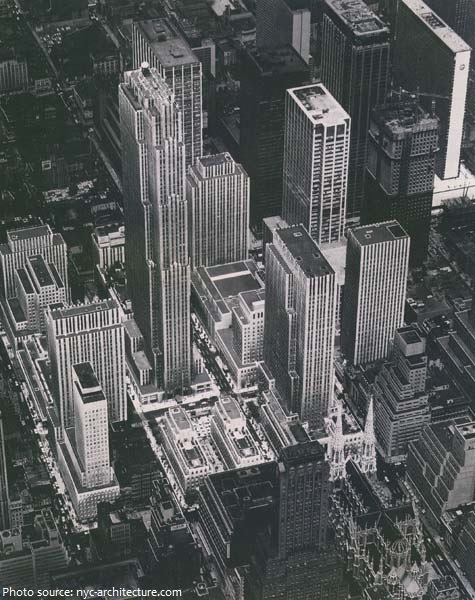 The current Center is a combination of two building complexes: the original 14 Art Deco office buildings from the 1930s, one building across 51st Street built in 1947, and a set of four International-style towers built along the west side of Avenue of the Americas during the 1960s and 1970s. 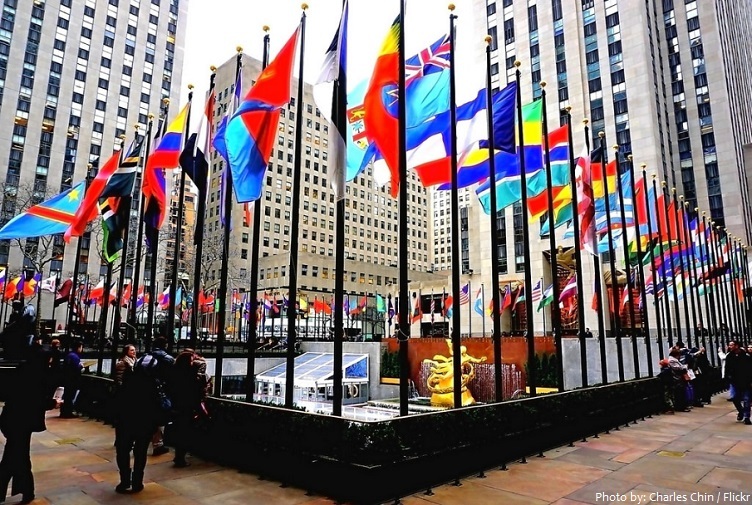 Rockefeller Center comprise over 743,000 square meters (8,000,000 square feet) of interior space. The centerpiece of Rockefeller Center is the 70-floor, 266 m (872 ft)-tall building at 30 Rockefeller Center, centered behind the sunken plaza. It is alternatively known as the Comcast Building and 30 Rock (also the name of a comedy television show), and formerly known as the RCA Building and then the GE Building. 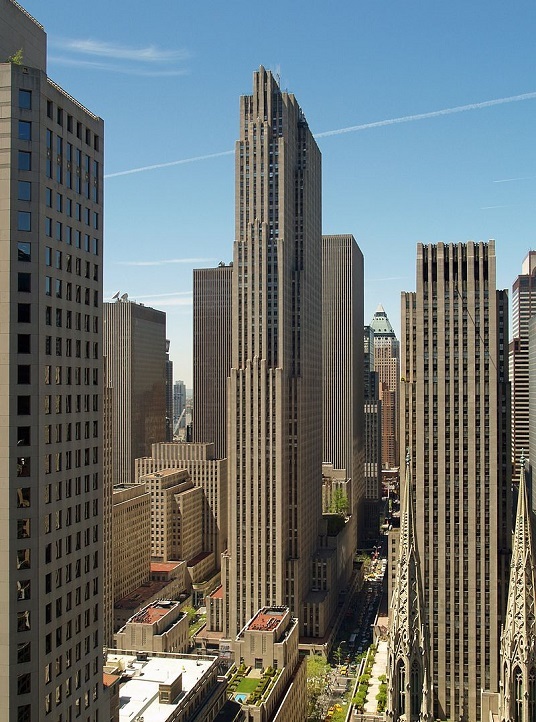 Unlike most other Art Deco towers built during the 1930s, the Comcast Building was constructed as a slab with a flat roof and since 1933 has been home of the Center’s observation deck, the Top of the Rock. 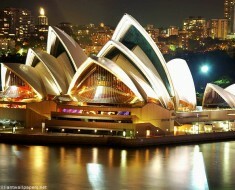 It is one of the most popular Manhattan landmarks. 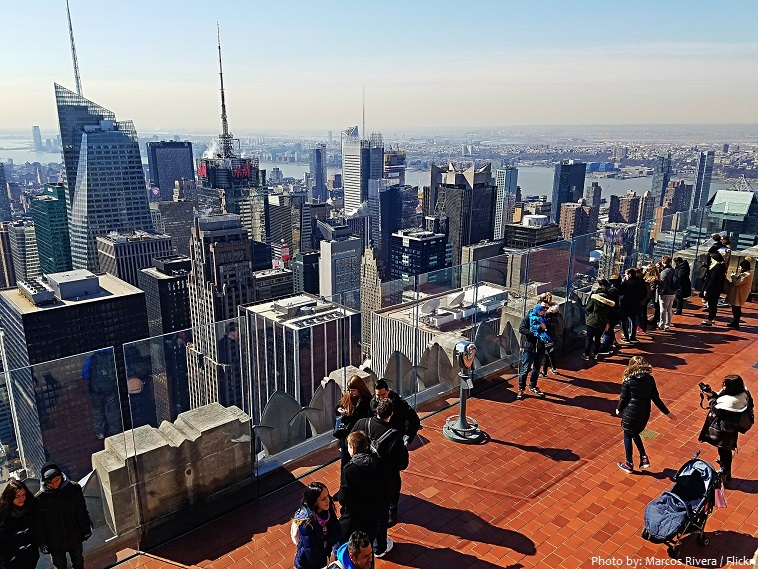 The Top of Rock offers breathtaking views of the Empire State Building, Central Park, and many other sights in the Big Apple. 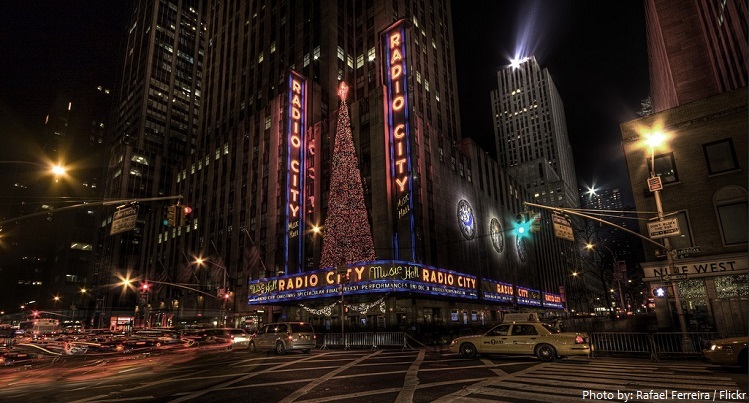 Radio City Music Hall was completed in December 1932. 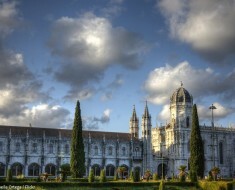 At the time, it was promoted as the largest and most opulent theater in the world. 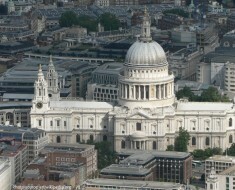 The Music Hall seats 6,000 people and after an initial slow start became the single biggest tourist destination in the city. Its interior was declared a New York City landmark in 1978. Painstakingly restored in 1999, the Music Hall interiors are one of the world’s greatest examples of Art Deco design. Rockefeller Center hosts the famous annual Christmas tree, which ranges in size from 18 to 30 meters (60 to 100 feet) tall from year to year and is covered with over 50,000 LED lights. The Swarovski-crystal star that tops the tree first appeared in 2004 and is nearly 3 meters (10 feet) in diameter. 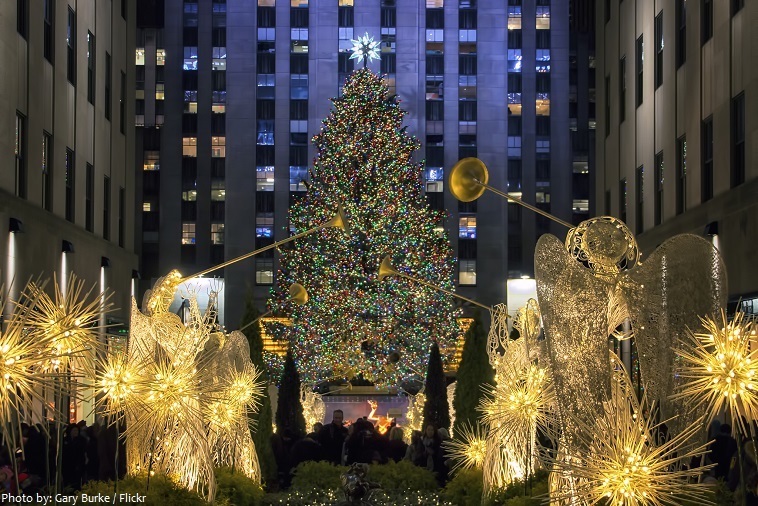 The tree is positioned in front of the central feature of Rockefeller Center: the Comcast Building. 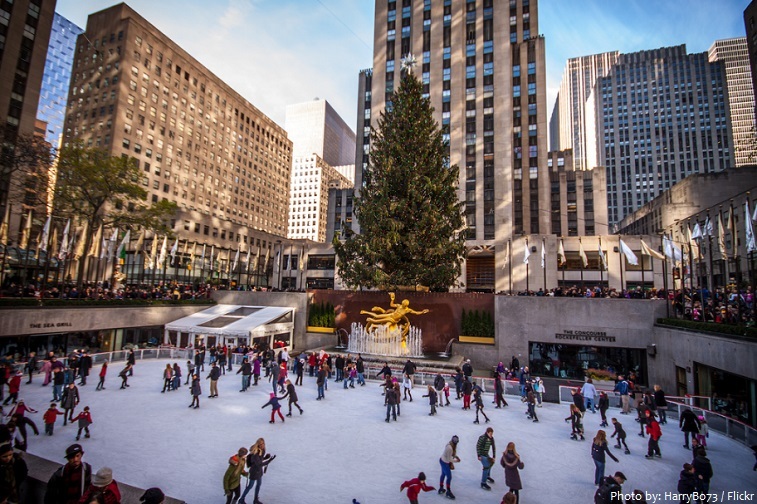 Immortalized in countless films and television shows, ice skating at Rockefeller Center is the quintessential New York City holiday activity. The rink is open from mid-October to mid-March, but there’s nothing like skating beneath the historic Rockfeller Center Christmas tree in December. More than half a million visitors flock to the Rockefeller Center ice skating rink each year, both to skate and to be spectators. The art in Rockefeller Center is not just around for aesthetic pleasure, but it also has a purpose. 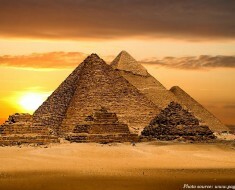 The four phases that the art is meant to show are: historical background, progress in physical matters, intellectual and spiritual advances, and progress of people as a whole. More than 100 murals, sculptures, and mosaics by 39 different artists adorn Rockefeller Center. 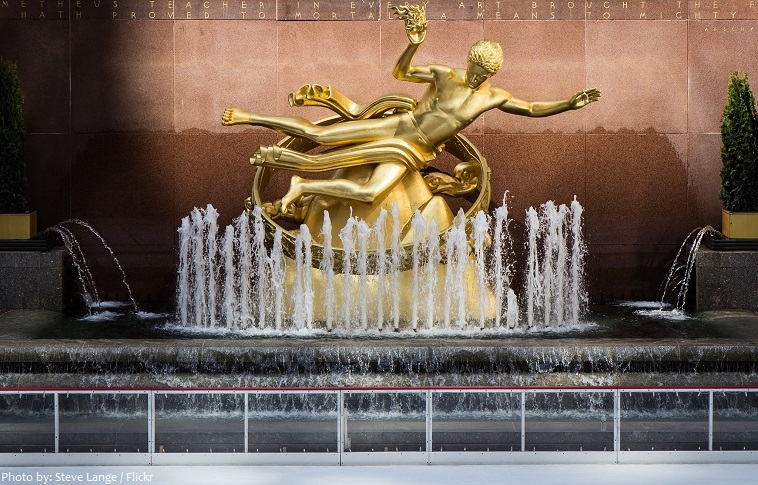 Rockefeller Center represents a turning point in the history of architectural sculpture: it is among the last major building projects in the United States to incorporate a program of integrated public art. 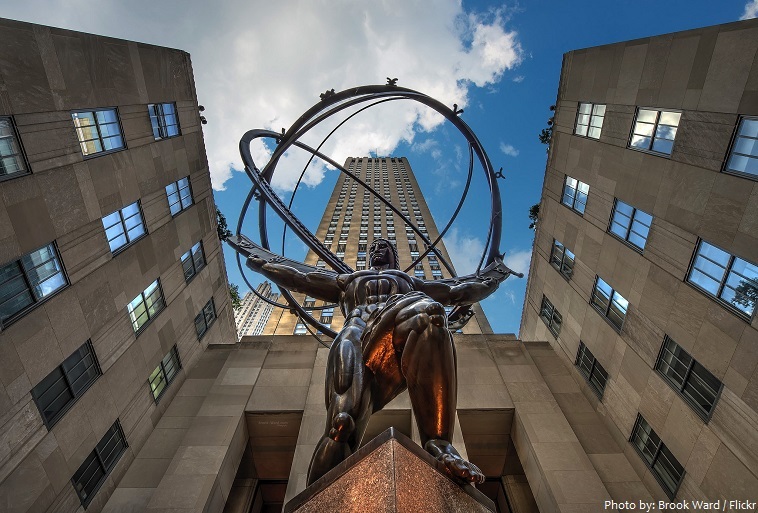 Sculptor Lee Lawrie contributed the largest number of individual pieces – twelve, including the statue of Atlas [photo below] facing Fifth Avenue and the conspicuous friezes above the main entrance to the Comcast Building. 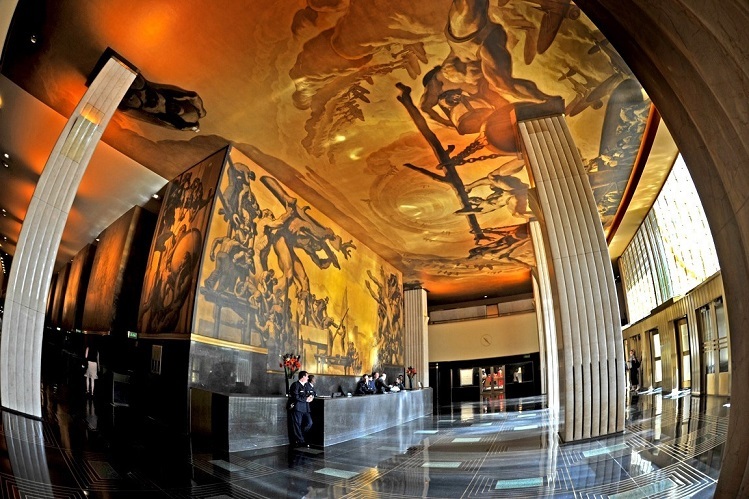 The lobbies of the buildings at Rockefeller Center are also interesting, in particular that of the Comcast Building, which is decorated with majestic murals created in 1933 by Josep Maria Sert. Some 200 flagpoles line the plaza at street level. Flagpoles around the plaza display flags of United Nations member countries, the U.S. states and territories, or decorative and seasonal motifs. During national and state holidays, every pole carries the flag of the United States. 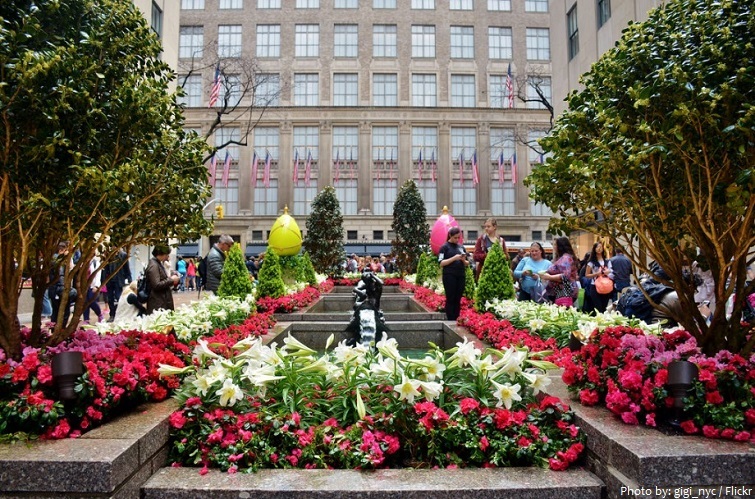 Throughout the year, the Rockefeller Center Channel Gardens blooms in uniquely themed plant installations that transform with the seasons. Rockefeller Center is one of the most popular attractions in NYC. In 1976 the American Institute of Architects declared Rockefeller Center the second most significant piece of architecture in America (Thomas Jefferson’s University of Virginia is first). 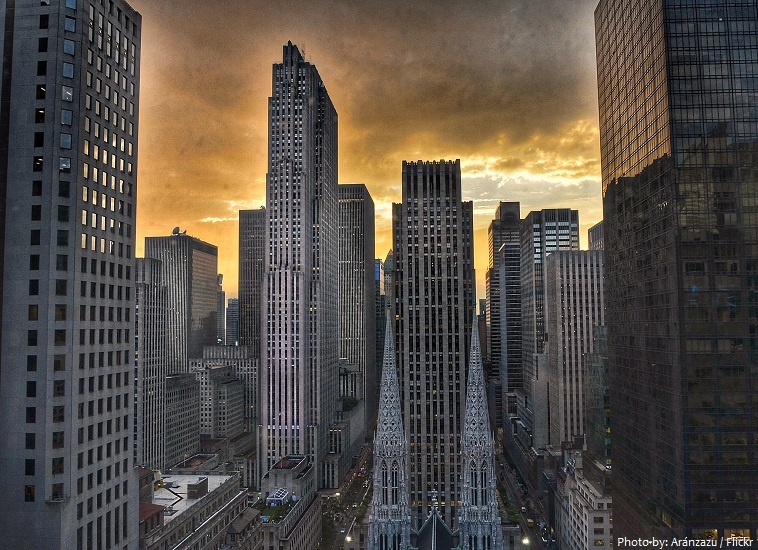 In 1989, Mitsubishi Estate, a real estate company of the Mitsubishi Group, purchased the entire Rockefeller Center complex, and its owner, Rockefeller Group. 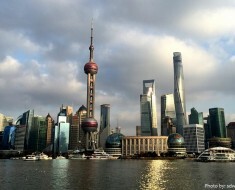 In 1996, the entire complex was purchased by a consortium of owners that included Goldman Sachs (which had 50% ownership), Gianni Agnelli, Stavros Niarchos, and David Rockefeller, who organized the consortium. Tishman Speyer, led by Jerry Speyer, a close friend of David Rockefeller, and the Lester Crown family of Chicago, bought the original 14 buildings and land in 2000 for $1.85 billion.